How to complete customs clearance formalities in BRAZIL? What are the necessary procedures to complete export customs clearance in Brazil? What is the customs process in Brazil to export? This piece of information explains about export customs clearance procedures in Brazil. The information details on how to export goods from a Brazil port to other overseas destination. The Customs Department of Brazil is under Receita Federal. It controls the import and export activities going on, in the country. The exporter must be registered with the Secretariat for Foreign Trade (SECEX), have a registration number in the national register of persons (CPF) or in the national tax register (CGC) for export clearance. 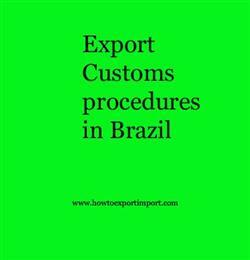 This information explains about export customs clearance procedures in Brazil. The information details on how to export goods from a Brazil port to other overseas destination. Procedure to get customs clearance to export in MANAUS. Mandatory process need to complete export in ITAJAI. The way to get customs clearance process to export in BELEM. Export customs procedures required in BELEM. Export Customs process in Petrolina. Process to export to Recife. Requirements of customs to export from VITORIA. Customs requirements in SANTOS to export. Customs needed to export from RIO DE JANEIRO. How can I clear customs to export from RIO GRANDE. What Customs formalities required to export in PORTOALEGRE. What should I do to export goods from RECIFE. How to get export customs permission in MACAPA. The legal strength of Bill of Exchange in International Trade. What is Bill of Exchange in International Trade.